UNCASVILLE, Conn. – June 2016 – Barrett-Jackson, The World’s Greatest Collector Car Auctions®, will feature exceptional GM diversity and style at the inaugural Northeast Auction on June 23-25, 2016, at Mohegan Sun. 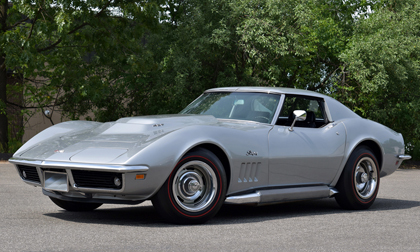 Amongst the highlighted GM vehicles are a 1969 Chevrolet Corvette L88 (Lot #688) and two 1969 Chevrolet Camaros – one a matching-numbers Z/28 (Lot #671), the other a full-on Pro-Touring custom (Lot #671.1). The 1969 Chevrolet Corvette L88 (Lot #688) on the docket is documented by the original Tank Sticker, a copy of the Window Sticker, owner’s manual and Protect-O-Plate. It is loaded with heavy-duty factory options, including factor side exhausts, M-22 Rock Crusher 4-speed manual transmission, J50 power brakes, J56 HD brakes, transistor ignition, rear-window defroster, as well as tilt and telescopic steering. It has undergone a comprehensive, frame-off restoration by one of the leading L88 restorers and Bloomington Gold judge, Tim Thorpe. Awards this L88 has accrued include NCRS Top Flight, Bloomington Gold Certified, Muscle Car & Corvette Nationals Gold Concours and Triple Diamond, L88 Invasion “Special Collection” 2008, and Muscle Car & Corvette Nationals L88 Invitational 2009. Also highlighting the Mohegan Sun docket are two contrasting, but equally impressive, 1969 Chevrolet Camaros. Documented by Camaro expert Jerry MacNeish as being a legitimate, matching-numbers Z/28 with the Rallye Sport Package, Lot #671 is a phenomenal Camaro Z/28 RS Can Am 302 Cross-Ram. It has been treated to a full rotisserie restoration by Camaro collector Gary Volpicelli and retains most of its original sheet metal. The other 1969 Camaro (Lot #671.1) is a full-on Pro-Touring creation. Starting with a gently used 6-cylinder coupe, its platform was elevated to meet the challenge of Autocross racing, but with full streetability at the core. Suspension upgrades include a complete C5 Corvette front suspension and 4-link, J-bar rear suspension with Bilstein adjustable coilover shocks at all four corners. Quadrupling the original 6-cylinder’s 145 horsepower, this beastly Camaro features an all-aluminum 400ci small-block V8 putting out 580hp with help from Accel/DFI fuel injection, Dart cylinder heads, a Wilson intake manifold and ceramic-coated headers feeding a custom Borla center-exit X-pipe exhaust system. A 1969 Pontiac GTO Convertible (Lot #645) will be one of the handful of GTOs to cross the auction block at Mohegan Sun. According to Pontiac Historical Services, this particular GTO is one of only 14 built with the original potent Ram Air IV V8 engine and equipped with a 3-speed Turbo 400 Hydramatic transmission. This example takes full advantage of the Ram Air IV with a 3.90:1 Safe-T-Track limited-slip rear end, the strong driveline complemented with power steering, power front-disc brakes and special suspension to make the GTO one of the fastest, most capable-handling cars of its time.